It appears the San Diego City Council will have a 6-3 Democrat supermajority, making it immune to Mayor Kevin Faulconer’s veto, with incumbent Lorie Zapf headed for defeat. Though the City Council is technically nonpartisan, Zapf is a Republican and her challenger, Jen Campbell, is a Democrat. In addition to Zapf, another incumbent, Myrtle Cole, was also trailing badly, though her district will remain Democratic. It was a stunning development because historically no San Diego City Council incumbent has ever lost an election. 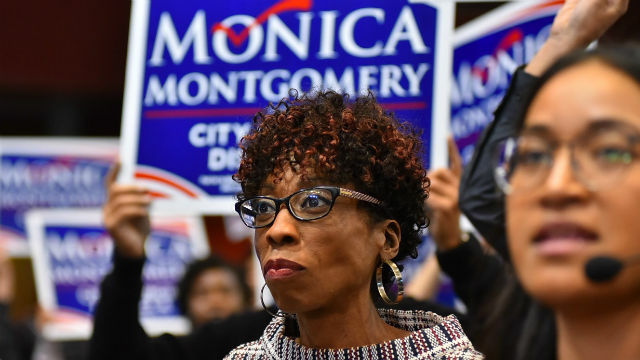 With a council supermajority on the line, the partisan race for the council’s seat representing District 2 has became one of the fiercest in the city. With 73 percent of the precincts reporting, incumbent Republican Lorie Zapf was trailing her challenger, retired physician and Democrat Jen Campbell, by 44.5 percent to 55.5 percent. It was a stunning upset after Zapf cruised through the primary with 44.6 percent of the vote, more than double anyone else’s share of votes in the district. Zapf shook off an August challenge to her re-election eligibility by third-place finisher Bryan Pease, who argued that Zapf was termed out because she had already served two terms. Campbell has argued that Zapf is more closely aligned with President Donald Trump than the coastal district’s left-leaning population, where Democrats outnumber Republicans by roughly 10,000. District 2 residents have also had campaign advertisements and mailers thrust upon them, highlighting past comments by Zapf — which she later apologized for — disparaging gay people and homosexuality. 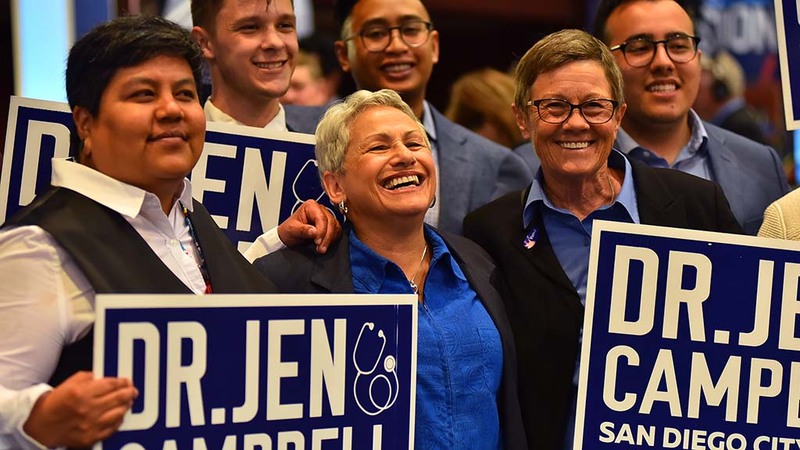 Zapf’s mailers have argued that Campbell may have committed disability fraud and should be dismissed as a viable candidate on that allegation alone. Democrats had also hoped to flip District 6 to ensure a supermajority, however, early returns show Christ Cate handily beating former radio personality Tommy Hough. Cate is leading Hough 58.1 percent to 41.8 percent. 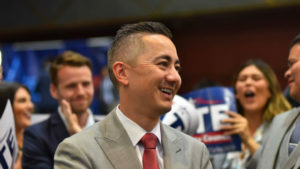 Registered Democrats outnumber Republicans by roughly 6,000 in the district, which includes Mira Mesa, Clairemont and Kearny Mesa. Considered the wild card this election because current City Councilman David Alvarez, a Democrat, is termed out. In his stead, his staffer Vivian Moreno is running against San Ysidro School District Board member Antonio Martinez, ensuring the council will have at least one new face when it reconvenes after the election. Moreno is leading Martinez 54.7 percent to 45.2 percent. Both are Democrats. Measure K would correct the phrasing in the City Charter’s term-limit provision for City Council members, limiting them to two terms regardless of district. In essence, Zapf would not be eligible for re-election this year had the specifications in Measure K already been on the books. Measure K will pass with an overwhelming majority. Voters approved the measure 88.2 percent to 11.8 percent. Measure YY, meanwhile, has faced staunch opposition from taxpayer groups and local conservatives, who argue that it will run up an eight-figure debt for the county. The measure would authorize the San Diego Unified School District to issue $3.5 billion in bonds to fund repairs and upgrades to schools across the district. It is passing with 60.2 percent of the votes in early returns. It only needs 55 percent to pass.